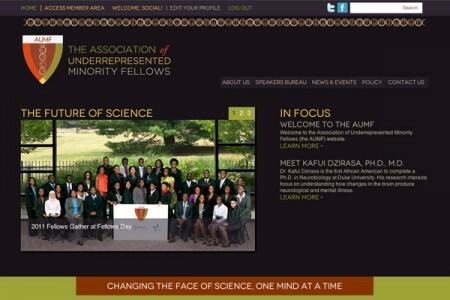 The Association of Underrepresented Minority Fellows (AUMF) is nonprofit member organization promoting the work and building a professional network of minority biomedical scientists at the undergraduate, graduate, and postgraduate levels. 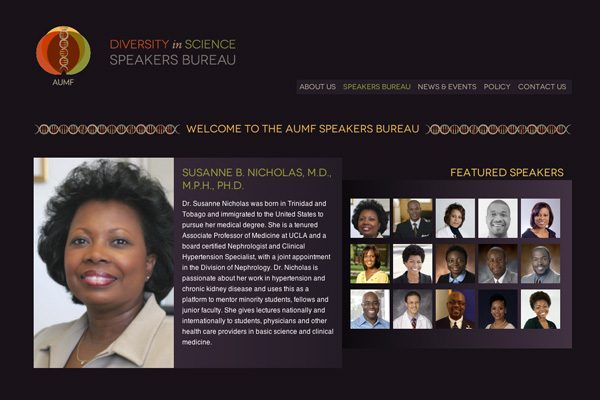 Funded by the NAACP, the AUMF maintains a voice in the dialog around national science policy. Working directly with Executive Director John Gates, Social Ink crafted a “soup to nuts” solution for a brand new visual identity, multi-faceted website network, and print peripherals. To kick off the project, Social Ink worked to create a new brand and visual identity. Anchored by its new logo, the organization re-branded around themes of academia, science, and diversity. The shield logomark and layered, earth-tone color palette grounded the aesthetic, complemented through use of crisp, modern typography and complementary graphic elements such as a color-matched DNA strand. Equipped with a cohesive new identity, our process shifted web and interface design. The AUMF platform required both a public-facing site and an internal member site, where members of various roles and privilege can log in and find contact information, internal updates, news about events, and so on. Keeping in mind both the need for unique identities but also a consistent overall approach, we employed inverse dark/light color schemes while maintaining core colors, typography, and graphic elements. Through analysis of primary and secondary audiences, we designed different layouts for the main landing sections of the site to prioritize different types of content and information. Final designs in place, we began work on a revamped web platform, including the protected members-only area for Fellows and Partners to network and build resources. By making use of the WordPress Multisite Content Management System (CMS), we were able to build both the public-facing and the private user site on a different subdomain, providing a singular administrative control access point for both sites. Through custom code, we deployed advanced database interaction for listing and extending user profiles, slideshows, multiple feeds and cross-listing of taxonomies and categories, exportable application forms. Toward project close, we got some surprising news: the organization was developing a sub-unit of public speakers and would require a standalone website to advertise and promote the initiative. 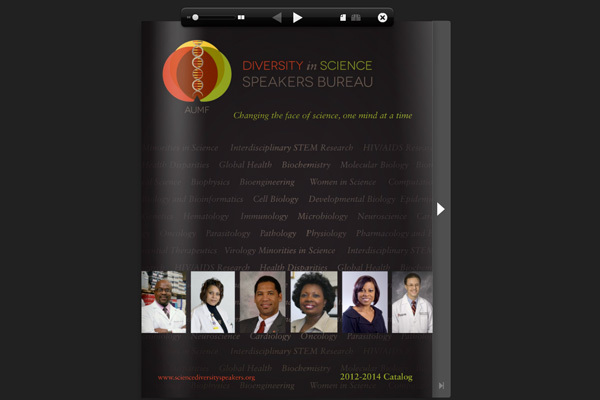 Because of our extensible codebase, we were able to build out this Speakers Bureau microsite with maximum efficiency, launching the program into the public eye in a few short weeks. Social Ink was founded as a full service design and development shop, and project scope included several peripheral print items. Extending from our core visual identity work, we put together a 50-page Speakers Bureau booklet, lapel pins, brochures, and postcards, embellishing the brand and producing outreach materials that extend beyond the web. As the AUMF continues to grow and evolve, we raise a glass, to scientists everywhere, and an ongoing relationship!